Via ferrata (or iron road in Italian), is a mountain path consisting of a series of rungs, rails and cables embracing the rock face. 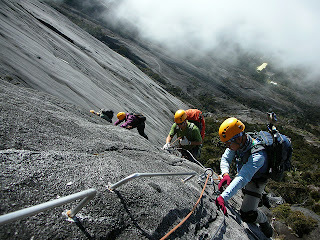 There are more than 300 via ferrata routes around the world and the world's highest via ferrata, can now be found on Mount Kinabalu in Malaysia, whereby the highest point starts at 3,400 m and ends at 3,800 m. This is the first time that the sport of via ferrata climbing is being introduced in Asia. An activity for everyone, the via ferrata is devised to give people with little or no climbing experience access to rock faces normally reached by mountaineers and rock climbers.There are several requirements for one to take part in the via ferrata activity, including having an average fitness level, being able to hike up to 3,200m in 6 hours, being at least 10 years of age, being at least 1.3 metres tall; and, especially, having a fearlessness of heights (or willing to conquer their fear of heights). This is a challenging adventure, and those interested to experience via ferrata on Mount Kinabalu should note that the beginner's route will let the climber take their first experience along the granite walls of Mount Kinabalu (a journey of about 2–3 hours). 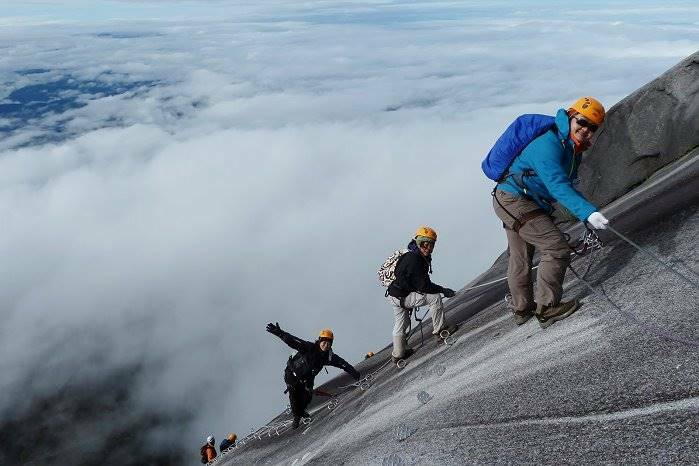 So if you love adventure, Malaysia is surely the place to be!